The 1899 pamphlet put out by the Ninth Ward Improvement Association and introduced in the last post was intended to lure new residents and business owners by promoting (perhaps with some excess) the manifold benefits of living and working in the community. Consequently, photos of dozens of homes and biographical sketches of many of the people who lived in them made up a significant part of the publication. While these included prominent Angelenos of the time like neighborhood founder William H. Workman, capitalist and ex-city council member Burdette Chandler, philanthropist Elizabeth Hollenbeck, and county supervisor and former city council member Robert Wirsching, it isn't at all surprising that almost every person mentioned in the pamphlet was an Anglo, with two exceptions. 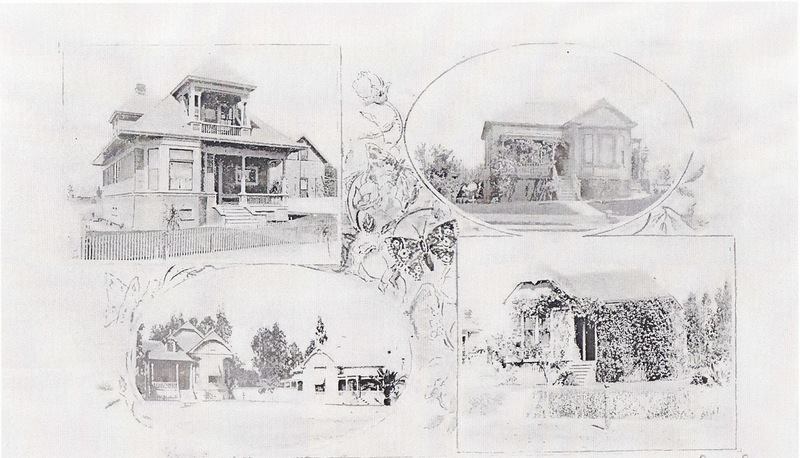 A page from "Beautiful Highlands of Los Angeles," published by the Boyle Heights Improvement Association about 1899 and showing, at the upper left, the residence of Kiu Sing Chan and family. Click on the image to see it and the one below in a separate window and in a larger view. To the Eastern visitor who is visiting Southern California for the first time, there is one element of our population which never loses its interest, that is the Chinese. Finding a climate as balmy and mild as their own, [and] a market for their labor and wares superior to their own, they have settled in great numbers in our State, generally having a sort of colony of their own in every larger town. A great many of them speak English, but imperfectly, or not at all, so when they come in contact with the government in a business way, they must have an interpreter. The reason for this strange diversion was (evidently) soon explained by noting that "Chan Kie Sing," who emigrated from his homeland to the U.S. in 1871 and was a merchant in San Francisco, arrived during the great land and population boom of the late 1880s in Los Angeles, "where he has since filed the office of Court Interpreter." The account concluded with another racially-loaded statement that, "Mr. Sing, with his wife and pretty little oriental children, lives in a cozy little cottage, No. 2309 East Third street." This is a detail of the Kiu Sing Chan house from the "Beautiful Highlands of Los Anglees" publication . A little digging reveals quite a bit more about this family. Even though he was often referred to as "Chan Kie Sing", "Chan Kin Sing" and "Chan Kiu Sing," (this issue of misspelling and misidentifying Chinese names being quite common--frustratingly for the researcher), his actual name was Kiu Sing Chan. Born, according to the 1900 census, in October 1854 in China, Chan's emigration date, according to census information, does appear to be about right in the pamphlet description, sometime between 1870 and 1875. His arrival in the late 1880s was also accurately noted, as was his work as a court interpreter from early on. Indeed, Chan continued in his line of work throughout the remainder of his life and it was his listed occupation on the 1900, 1910 and 1920 censuses. He was, however, also a vital member of the Methodist Episcopal Church's Chinese Mission in Los Angeles. In 1896, he served as a master of ceremonies for a Chinese New Year celebration held at the mission and a Los Angeles Herald article noted that he was a "courteous reporter and interpreter" and then went on to express amazement about "his wonderful accuracy of speech" and "acquaintance of the more subtle niceties of the English tongue," which praising his admonition to the audience "to abandon their ancient faith." According to Lisa See's important book On Gold Mountain, Chan was the first Chinese licensed Methodist minister in the United States and was pastor of the Los Angeles Chinese United Methodist Church from 1900 until 1923. Occasionally, articles in the Los Angeles Times and Herald newspapers mentioned Chan's ministering, as, for example, when the church had an observance after the asssassination of President William McKinley, not long after his visit to Los Angeles in 1901. Chan was also passionate in his rebuttals to claims by ministers from other faiths who expounded the commonly-held view that the Chinese could not be assimilated or be good Christians, as evidenced in long letters published in The Times in 1909 and 1913. Occasionally, he gave lectures on the relations between America and China, such as one given to an electrical industry association in Los Angeles in 1916. In addition to his court interpreter position and ministering, Chan had other endeavors, such as when he and a partner leased twenty acres near the city and planted them to asparagus. This project ended badly, however, when, during the second year of the lease, the owner went in and destroyed the crop and small buildings associated with the venture after a dispute over unpaid rent. Chan sued and won a judgment for damages in court, but, on appeal, the verdict was overturned, the state supreme court finding that it was not possible to know whether the amount claimed for damages could be verified from books Chan indicated he kept and also noting that he had told someone that he could not make a profit on the lease and afford the rent. 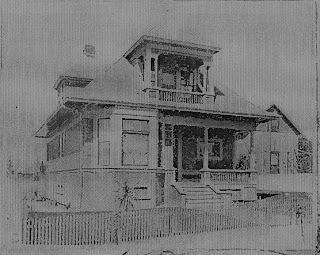 With respect to the Boyle Heights house, it appears that Chan and his wife, Loy (also referred to as Nellie) and their large family, appearing to have consisted of eight children, with one or two dying in childhood, moved to the residence in the very late 1890s, just before the publication was issued. Prior to that they resided at Wall Street and 6th Street downtown, but, once reestablished in Boyle Heights, the Chans occupied their home for decades. While Kiu Sing Chan appears to have died around 1923, his widow and a few of their children were in the house until at least the 1940s. What is striking about the census returns is not just that the Chans were the only Chinese family in the vicinity of Third between Breed and Soto streets, but how the neighborhood changed. The 1900 sheet on which they appear includes otherwise "Anglo" surnames like Dorland, Peters, Evans, Shields, Conrad and Archer. Across the street was the family of James G. Bell, whose wife Susan was a Hollenbeck, related to prominent Boyle Heights resident John E. Hollenbeck. Bell's daughter, Maud, was in the first graduating class at Occidental College when it was established in the Heights and his son, Alphonzo, went on to be a prominent developer (Bel-Air, Bell Gardens) and oil magnate at Santa Fe Springs. By 1910, the demographics were largely the same. With the 1920 enumeration, though, came some changes. On the same sheet as the Chans were four Latino families bearing the surnames of Moraga, Velez, Villegas, and Sandoval and the family listed above them consisted of Jews Morrie and Fannie Hirsch and their two children. A decade later, after Kiu Sing had died, his widow and three children lived amongst predominantly Jewish neighbors, many of whom were born in Russia, Poland and Hungary. There was one Latino family, the Garcias, who lived near the Chans on Third and two "Anglo" families. This diversity was still reflected in the 1940 census, several families of Russian Jewish descent, a Latino family, and a Japanese family, the Kosakos, lived around the corner on Breed Street. Three "Anglos" lived together in one household as the ethnic diversification of Boyle Heights is reflected in microcosm on this one census sheet. Of the over fifty houses shown in the 1899 pamphlet, only about a third of them survive today, but one of them is the longtime residence of Kiu Sing Chan and his family. In addition to the image of the house from the pamphlet shown above, here is a Google Maps link that shows how the structure looks today: click here. This contribution was made by Paul R. Spitzzeri, Assistant Director, Workman and Temple Family Homestead Museum, City of Industry. Interesting article about the demographic changes on one street in Boyle Heights between 1900 to 1930. Hello anonymous, thanks for the comment. The whole neighborhood changed a lot from 1900-30, maybe someday a post can address that. Hi Emmanuel, sorry for the late reply. All I knew about the house is what is in the post. Thanks for leaving the question and we hope to see you at a Boyle Heights Historical Society event.